I'm getting a little braver about letting some of my originals go. I just listed this tiny original watercolour in my Etsy shop. I love muscari (also known as grape hyacinth) for its beautiful colour, fragrance and delicate form. As far as behaviour goes, it can be a little rambunctious in the garden, so every now and then I need to round the bulbs up. But I couldn't imagine my garden without it. I took the above photo yesterday on our backstep. If I had taken it today, it would have been against a backdrop of snow. We had more overnight and it is still coming down. (Meeko is happy.) Thoughts of my garden get pretty intense at this time of year. Looking at past paintings of spring flowers helps while I dream of the real thing. 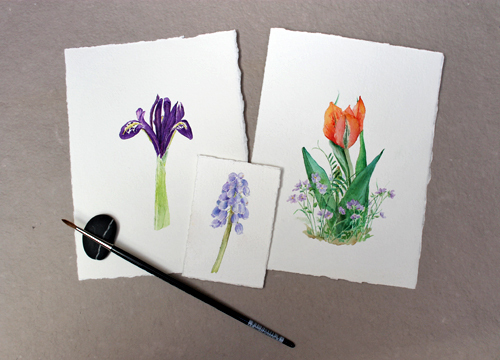 Dwarf iris, muscari and tulip paintings from past springs. Lovely - oh, how I long for spring flowers in my garden! I think our gardens have similar timing, Tina. Soon but not right away. Dear Kathleen - so beautiful. Makes me wistful for those muscari to bloom. Love the irises and tulipls as well. Hope you have a wonderful day. So many beautiful spring flowers to look forward to. Thank you, Debbie. So delicate - just beautiful! Thanks Cindy! Can't wait to smell them. 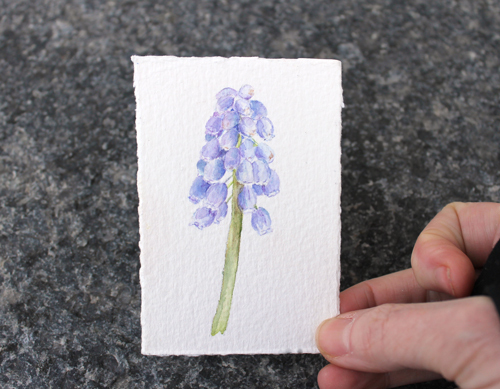 The grape hyacinth - such a beautiful flower with a lovely perfume - very delicately painted!